Targeted Individuals' allegations are regularly dismissed. Frequently, a judge will order one to take a psychological test. Anticipating these tests can cause worry and fear. Taking them in advance may allay yours. 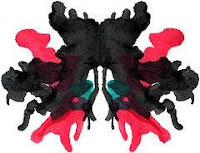 The Right Way to Answer an Ink Blot Test. Remember to clear your browser's cache to delete the test results from your computer. And thanks to "Not Me" of Multistalk for comments and assistance. Forewarned is forearmed. Good luck and may A Word to the Wise T.I. be sufficient.